I've been working on a small string conversion utility for turning strings into various code formats. Specifically, I've been writing a number of Visual Studio Code templates and VS code requires that templates are formatted into a JSON String Array, which means strings have to be split into lines with each line properly JSON formatted. This is a huge pain when creating large templates - especially HTML templates that contain lots of quotes that need to be encoded. 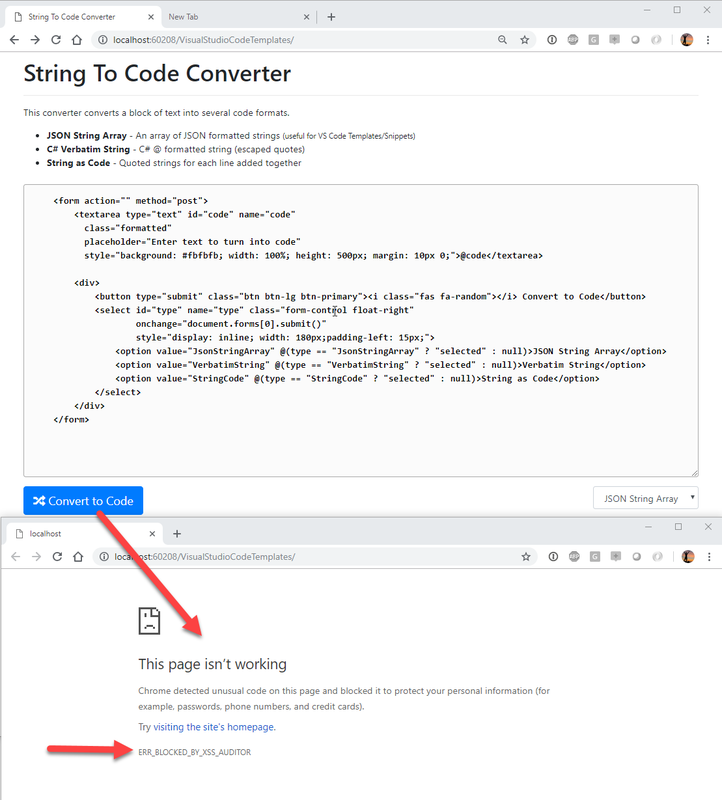 Long story short I threw together a simple Web Page String to Code Converter that handles this conversion (and a couple of others). Starting with Chrome 57, Chrome has started implementing an agressive XSS protection mechanism that prevents certain things from being posted to the server. There's a lot of debate of whether this functionality belongs in the browser or not and in fact other modern browsers do not implement an XSS Auditor any more. At this point Chrome seems to be only one that triggers this. FireFox and Edge run the requests no problem without the header. Chrome does not prevent POSTing of the data to the server, but it prevents sending a response when the XSS Protection is triggered. Thanks to Eric Lawrence for pointing that out. Presumably this behavior prevents you at least from echoing malicious content right back to the client - although that won't protect you if you return it on a subseqent request. Although currently this is a browser specific feature implemented by Chrome, it turns out there are some standards based protections built into the HTTP spec that allow for this. Specifically there is a X-XSS-Protection header that allows to tell the browser how to handle XXS protection. This options can explictly turn off the validation by setting the value to 0. Et voila, the form gets posted without browser complaints in Chrome! Problem solved. Request validation often is a good idea - until it isn't. For typical applications request validation is a good thing to avoid XSS attacks, although at the end of the day it's best just blanket HTMLEncode() all content (which BTW, my code above does yet it still triggers!). Bypassing any default request validation is usually only good idea for special cases like the one I'm dealing with here, which explicitly requires me to post HTML, XML and code snippets that can contain the offending angle-brackets. IOW - turn off validation selectively and not in a blanket move like for example adding X-XSS-Protection: 0 to your server's default headers. Or maybe you do, but give it some thought before you do and whether that makes sense. This allows bypassing ASP.NET Request validation. Ontop of that IIS also screws with request validation, and it often does so before ASP.NET gets control at all. Otherwise IIS fails the request before it ever hits the ASP.NET instance. Request validation generally is a good idea - except on those very few occasions when it's not 😃. Definitely a problem when doing something like I am in this case which is posting code that almost always would trigger validation. But it can also bite you in regular business scenarios when somebody posts some legitamite angle brackets as part of text input. Rare, but it happens and it's usually hard to catch this initially as this becomes a runtime error. Luckily there are workarounds. The X-XXS-Protection header solves Chromes XSS Auditor and various request validation options exists for server side code to be very specific about when you want to allow request validation to be bypassed.